Linear sham with jumbo silk piping. EXCLUSIVELY AT NEIMAN MARCUS Made of polyester/nylon with square pattern. Cotton/polyester back. Brush fringe trim. 25"Sq. Dry clean. Made in the USA of imported materials. Embroidered trellis sham embellished with chenille tufts. Silk/rayon/polyester. Dry clean. 26" x 26". Made in the USA of domestic and imported materials. EXCLUSIVELY AT NEIMAN MARCUS Floral chenille sham with twisted cording and jumbo tassels. Hidden zip closure. Front, polyester/viscose. Back, polyester. 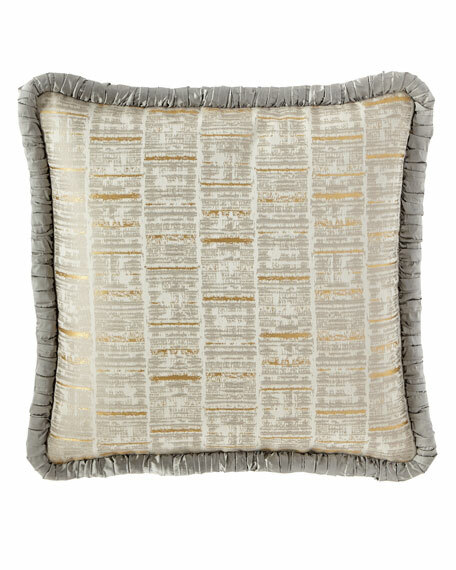 EXCLUSIVELY AT NEIMAN MARCUS Floral chenille sham with twisted cording and jumbo tassels. Hidden zip closure. Front, polyester/viscose. Back, polyester. 25"Sq. Dry clean. Made in the USA of imported materials.